Making jewelry from coins dates all the way back to ancient times with Egyptian, Greek and Roman examples highlighted in museum exhibits around the globe. Doubloons and other coins salvaged from shipwrecks dating back centuries often make their way into jewelry crafted today. But when it comes to what collectors seek, most coin jewelry falls into the Victorian through 1960s range. Victorian coin jewelry pieces, produced during the reign of Queen Victoria of England from 1837 to 1901, don’t frequently come on the market. When they do, these items can rival similarly aged karat gold jewelry in value. Prime examples are Victorian “love token" pieces. This jewelry is charming, literally, since the elements were made by engraving names, loving words, and symbols on coins that had been smoothed to remove the embossing and then fashioning them into charms dangling from bracelets and pins. Legend has it that many of these items were crafted by lonely sailors spending months at sea and then shared with loved ones when they were reunited. From the same era come pins, not surprisingly, made from English coins depicting Queen Victoria. The dates on the coins used in these pieces make it easy to ascertain when they were made, of course. Many were made using coins stuck to commemorate the Queen’s 50th anniversary on the throne in the late 1800s. The Edwardian era extends from approximately 1900 through 1914. 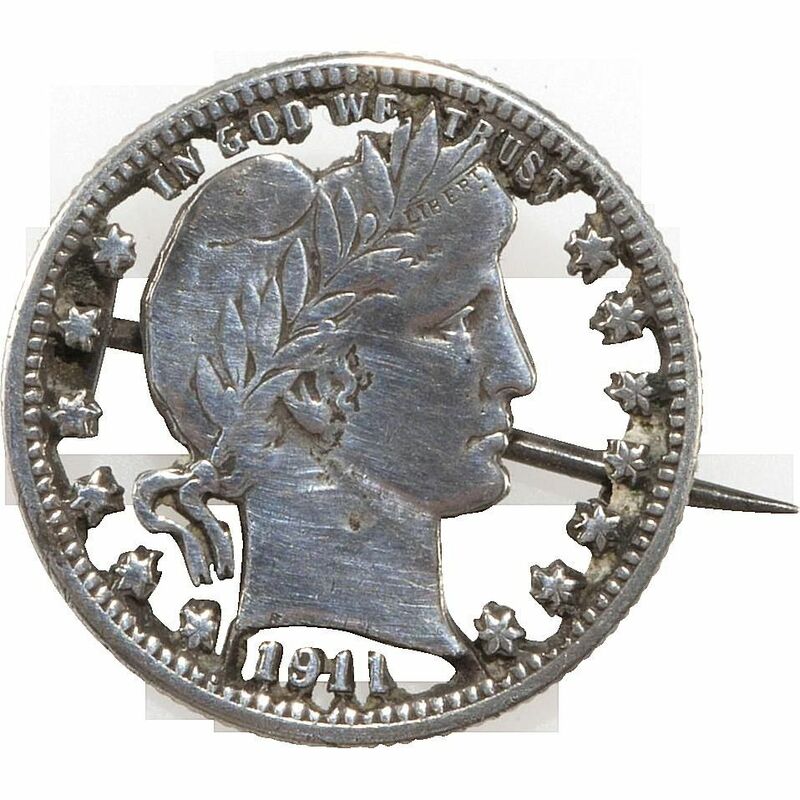 During this period Victorian influences in jewelry and fashion could still be seen, but as far as coin jewelry goes it became fashionable for jewelry crafters to actually cut away the non-decorative background of a coin before attaching a pin clasp and stem. This piercing of the metal left a frame filled with eagles, stars, famous profiles, bison or other decorative elements, along with the date. This technique coordinates with the lacy, more delicate design work incorporated into other Edwardian jewelry styles and indicates that a plain coin was far too ordinary this period. By the1940s, when war was raging in both Europe and the Pacific, coins were an available medium for trench art projects collectors refer to as “sweetheart” jewelry. Coins were often heated to add a domed effect, drilled, and then linked together to make jewelry sent home by soldiers and sailors to family, friends, and sweethearts. The most common coin projects like these were bracelets, but necklaces, watch chains, and other jewelry items have been found bearing 1940s coins from Australia, England and other points where servicemen were stationed around the world. It’s not uncommon to locate silver coins from the 1950s or copper pennies from the ‘60s or ‘70s soldered together to form attention-grabbing cuff bracelets, as these coins have always been readily available for jewelry experimentation. Gold plated pennies from the 1970s glued to bracelets sold in jewelry making kits can be found as well. Another fun brooch from this era has pennies dangling from a “money tree.” Whether seeking this type of jewelry through online auctions, yard sales or flea markets, it can still be purchased inexpensively. Souvenir jewelry made using coins has been made since the 1920s and ‘30s, with some styles being produced over many decades. Vintage bracelets linking Mexican pesos, Canadian cents and other world coins in an overlapping design, sometimes embellished with a dangling coin charm, can be found with dates ranging through the 1960s. Most collectors date these jewelry items according to the most recent coin present in the design, and they can also be purchased fairly reasonably today. Other affordable vintage coin pieces include coordinated necklaces, bracelets and matching earring sets, known as parures by collectors. These were often made in South American countries such as Peru, and include dangling metal embellishments. Others were fashioned by linking similarly colored coins in varying sizes together in a graduated style. In the 1970s, demand soared for finely crafted pieces bearing gold coins set in karat gold. Many Krugerrands were set in gold frames to form pendants during this period. Other gold coins were used as well and often embellished with chunky nugget and rope designs along with diamond and gemstone accents. The appeal of karat gold coin jewelry continued into the 1980s and early ‘90s, as evidenced by a series of feline-themed coins minted for the Isle of Mann in the United Kingdom being used for this purpose. American eagle gold coins were framed in pendant necklaces and ring mountings as well. Given in the intrinsic value of gold coins and fine jewelry in general, these pieces have held their value and still sell for respectable prices although many were sold for scrap in the recent past when gold prices hit record highs. From Victorian trinkets to trendy karat gold, one of the most interesting aspects of examining the wide world of coin jewelry is the veritable variety of styles, materials, and sentiments behind these vintage conversation pieces. There’s something out there to appeal to most jewelry collectors and coin aficionados alike.